4.1 out of 5 based on 34 bloggers and 7 commenters. 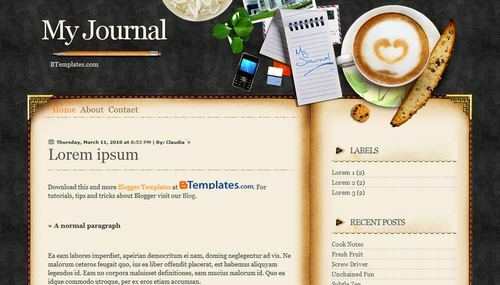 My Journal is a free blogger template with 2 columns and right sidebar. Excellent template for blogs about desktop. I’ll put it on my blog. what could be the problem? is it supposed to open in Safari? @katherine: You must unzip the xml file before you upload the template. Are you using the right software? I mean, izarc, winzip, winrar, etc. If you don’t know how to upload the template, read our FAQ. you have the best templates by the way, congratulations! i have no clue how to do this….i downloaded the file.. wut do i do next?? okay im clueless…i downloaded the file…what do i do next?